Did you know that you can register and vote all the way up to and including Tuesday right at the polls? If you are feeling uninformed or confused by a complicated ballot, I have time to review your ballot with you. Really. Any ballot. Anywhere. Begging, as if lives depend on it, because they absolutely do. Let’s get out there and vote! Thanks for sharing. 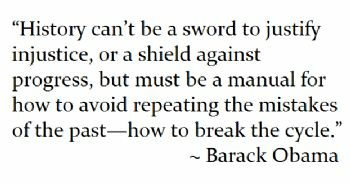 I love the quote from Barack Oboma. Even though I live in Canada, I appreciate what He did for the States. God bless you. Cast an early ballot today.